It seems that the main axial proportions of the skull are independent from the existence and/or type of POF. For instance, on the ratio diagram of Cormohipparion A (A-1), the skull 42449 from Kepler looks like a typical Cormohipparion A although it has no POF. 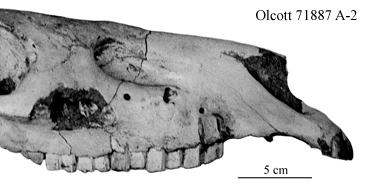 The ratio diagram A-2 shows that the skull 71887 from Olcott POF Olcott 71887, referred to H. cf. 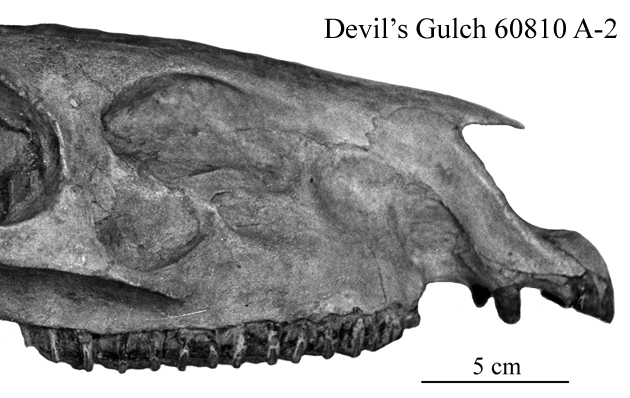 tehonense, has very similar proportions to the specimen 60810 from Devil’s Gulch POF Devil’s Gulch 60810. The first one may belong to a small Cormohipparion A, the last one does not belong to a Cormohipparion at all and has 3 or 4 POF. Dinohippus 11724, 87201, and Pliohippus 12998 have similar proportions (Dino-Plio 1) but only the last one has a well developped POF. en Equidae tridactyles (Hipparions sensu lato) Northamerican archaic skulls, mandibles, and (...) Remarks ?